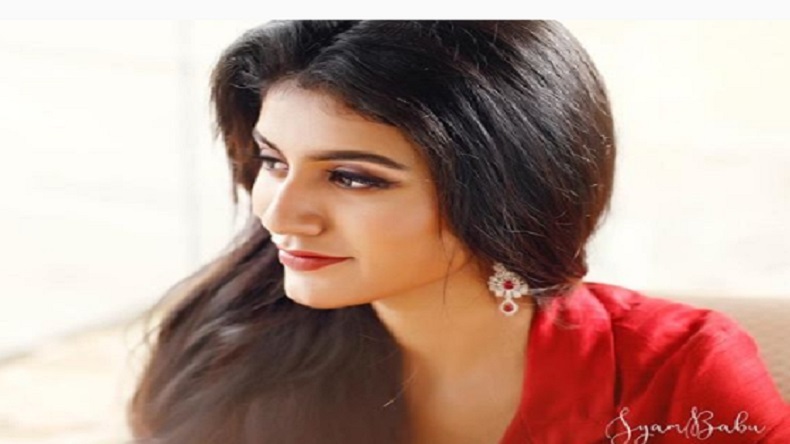 The overnight internet sensation famous for her wink, Priya Prakash takes the internet by storm in her ever gorgeous red gown and kohled makeup. This pretty lady yet again proves why she is called the national crush. Priya Prakash Varrier, the 18-year-old Malayalam actor winked her way into our hearts this Valentine’s Day, is all set to make her very first acting debut with Oru Adaar Love. She will be starring with Siyadh Shajahan, Roshan Abdul Rahoof and Noorin Shereed. The movie is going to hit the screens this Friday on September 14, 2018. Ahead of her film’s release Priya did a photoshoot for a magazine and is slaying the Instagram with her glamorous and drop dead gorgeous pictures in red. Our wink girl has paired her red gown with straight hair, kohled eyes and a perfect and a subtle makeup to emphasise her features and giving an edge to her look. She has accessorised her look with diamond studded earrings and bangles. Who would have thought this poised lady in the picture is the same girl who left internet elated with her single wink. With 6.4 million followers, the pictures have garnered more than six lakh views. The ravishing Priya Prakash Varrier became the talk of the town and the ‘national crush’ thanks to the video Manikya Malaraya Poovi aka wink video that went viral. As expected, the wink and cute expressions made the teenager an overnight sensation. More from the 🥀 series.